Argentine tango is both the music and dance of Buenos Aires. Born in the late 1800s from African and Criollo influences, it was finally shaped by the immigrants that came to Argentina, mainly from Italy and Spain. Tango became world famous after it was "adopted" in Paris before the Great War and ever since it has been synonymous with romance and glamor. 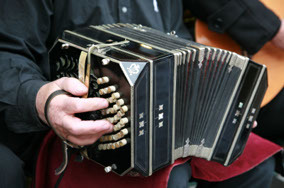 In Argentina tango music and dance continued to develop through the 20th century. The dance became more complex, the role of communication between partners grew, the embrace became more intimate and creativity and improvisation blossomed. In the 80s tango started to attract international attention and tango clubs sprouted in the main cities of Europe and the USA. Nowadays every big city in the world has plenty of tango classes, clubs and milongas (tango dance parties). As a dance, tango is expressive and improvisational and relies on a deep connection between partners. Its complexity is balanced by the slow tempo of the music and the lyrical, melodic musicality that makes it both smooth and intense.